History and model building all in one. Good stuff! I like the back story at least as much as the work itself. Will follow this thread! Tom wrote: Will follow this thread! I will be interesting to see how you do the sea and surf - step by step if you can. Would love to see how it is done. 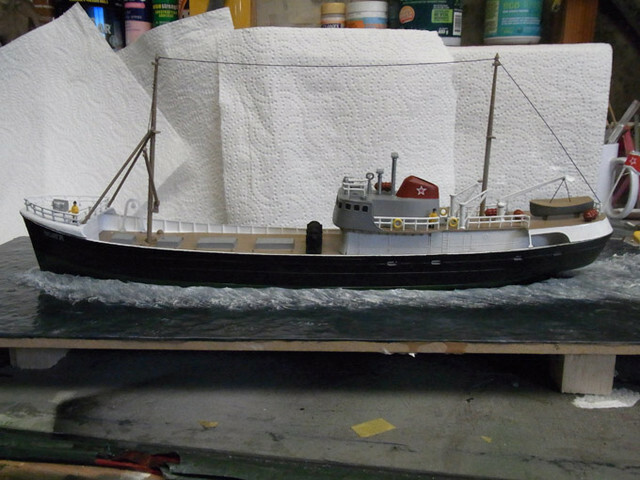 Some progress to report on the creation of the Russian Spy Trawler dio. My first "fitting" of the ship to its choppy seas. The stern is sitting up too high in the water right now. 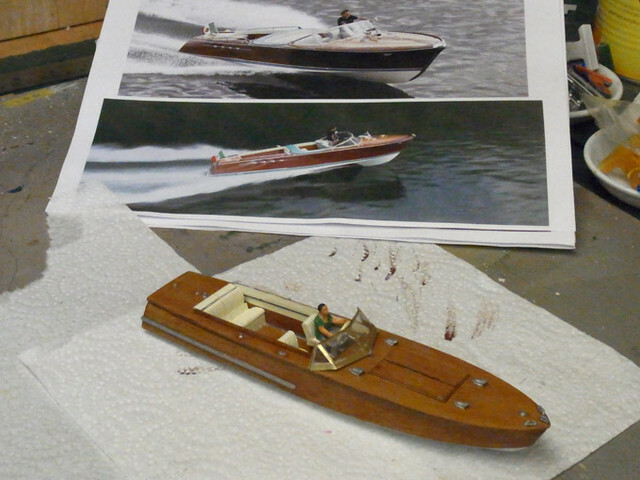 I'll glue balsa-wood 'spacers' to lift the dio 25mm higher so the hull doesn't touch the shelf it'll eventually sit on. And I'll create a 'skirt' style frame around it all to hide the undersides. And as requested, Johan, I have been taking photos as I've been going along in this, my first attempt at creating some kind of wake etc for a ship dio. Once I have got the ship sitting correctly in the water, with the skirts finished and the whole diorama done, I'll do a multi-pic post on how it all went, step by step. Very impressive! It woyld be great to see your step-by-step how to. 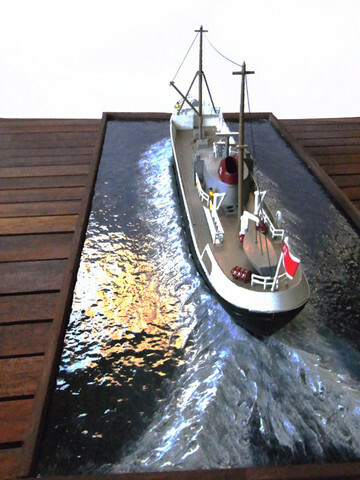 First, the finished "at sea" diorama in this posting, and then the "how to" stuff in a separate one to follow. 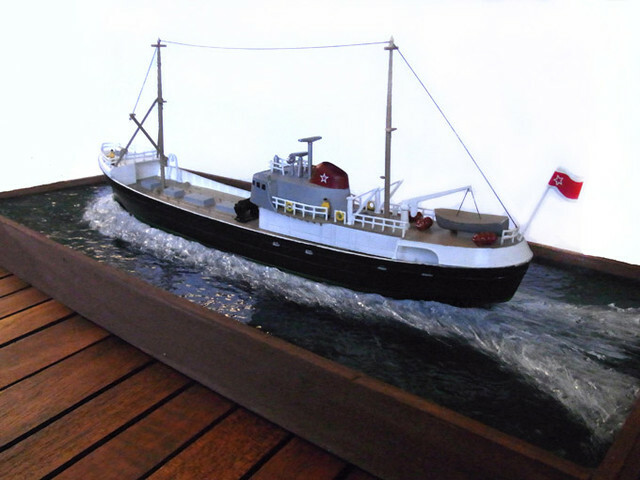 Russian Spy Trawler in the North Sea, Revell kit which doesn't mention the scale, but there is an almost identical "North Sea Fishing Trawler" kit also put out by Revell which says the scale is 1:142, so I presume this is about it. OK, now for the "how to". First up, a reference photo. Looking at dozens of trawler photos, there are as many "wakes" as there are trawlers. So I based mine on a real-world one and stuck to it. 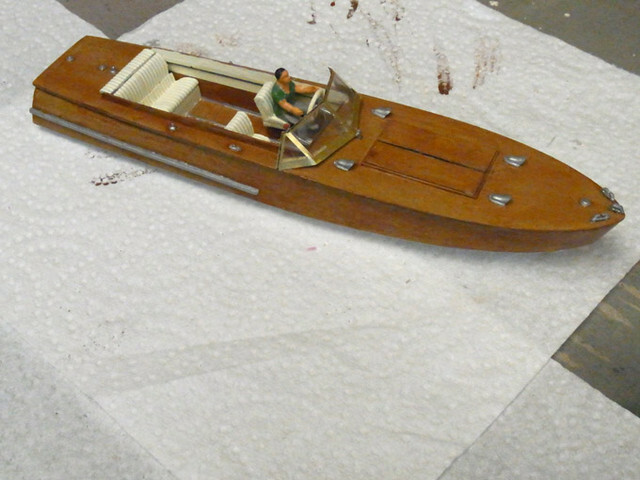 After building the model I then cut up some Craftwood board to size, and measured the boat carefully and cut a hole for it to size (this is because the model has a full hull, and I don't like that look. I want to see them "on the water". 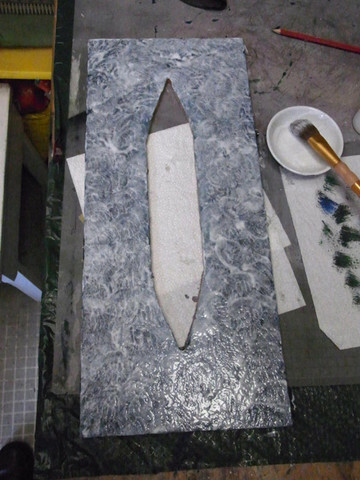 This photo shows the board with the first stage of painting done. (I'll detail how I did that in the next images). The sea colour itself is a mix of several colours: navy blue, black, green, light blue and white. The idea is to paint the sea navy blue, then start blobbing on some black splodges, then a few green ones here and there. The trick is not to brush on the other colours; they need to be dabbed on here and there with a thickish brush. The sea should not be a uniform colour, rather a patchwork of mostly dark blue and black, with flecks of green and light blue. Once that has dried, paint on your 'wake' in light blue. 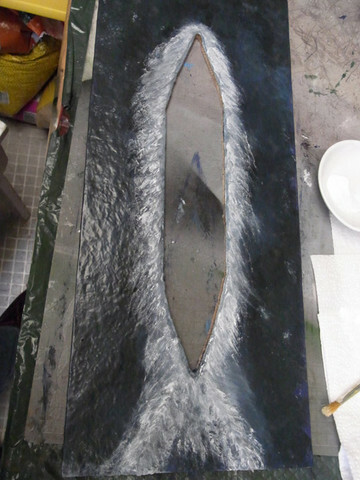 The next step is to make the water effects. For this I use a craft glue called Mod Podge. It goes on white and dries clear. As you do with the painted colour, you don't brush on the Mod Podge. You splodge it on thickly, with that thick, blobby-ended brush. Here's the Mod Podged board when it's wet. To get the watery effect, several coats of Mod Podge are needed. I did five coats this time, applying it quite thickly each time, and letting it dry for 24 hours between coats. 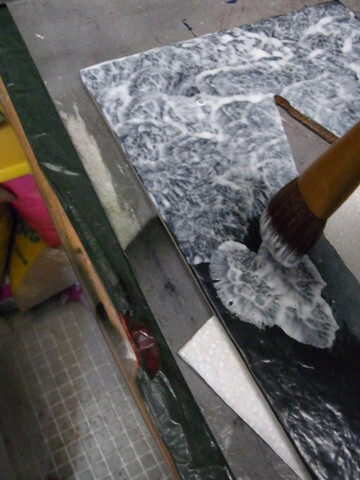 It's a water-based thing, so it's easy to clean up the brush each time, and it's usually touch dry in an hour or so. 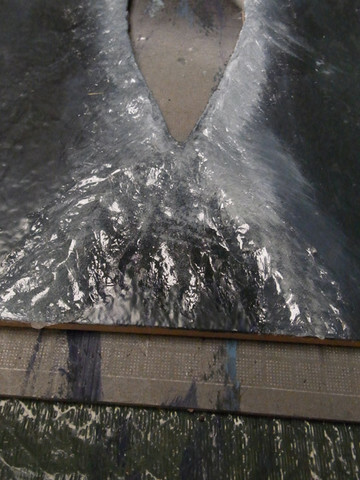 Heres the "water" effect of the Mod Podge. Next stage is to add the wake. 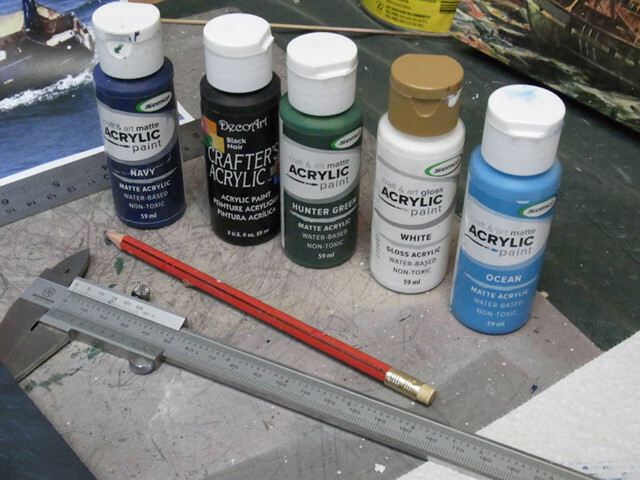 I used a clear silicone sealer, applying it in small lengths at a thickness of just 4-5mm. 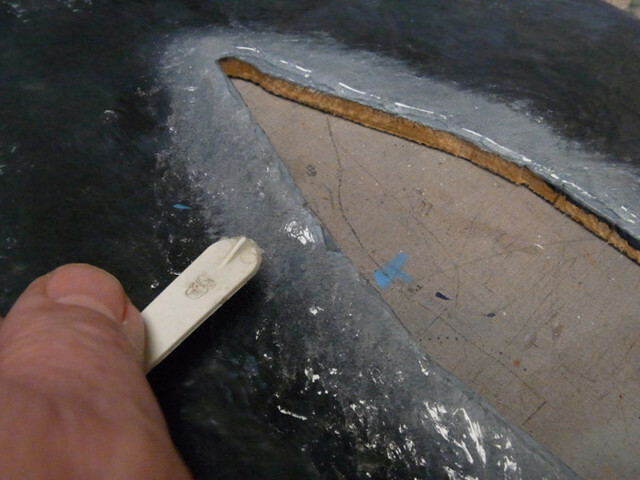 As soon as I apply each little run of silicone, I then use a plastic spoon handle (I didn't have a Paddle Pop stick handy) to streak out the silicone, away from the ship's hull. Depending on how thickly you apply the silicone, it could then need up to 72 hours to cure. So the best idea is to do a few thin coats, letting each dry overnight before applying the next. To tell the truth I didn't do the wake all that well, compared to the very good ones you can easily find online at the model ship-builders forums, etc, but I did have fun creating my beginner's version of a wake. Finally, you paint your wake. But there is a trick to this as well. 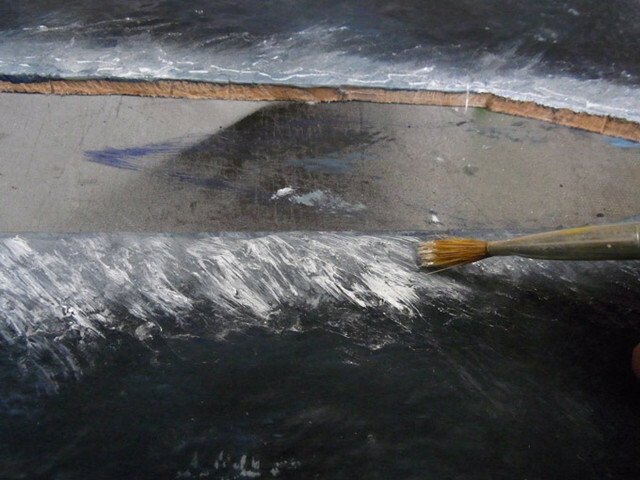 It's called "dry brushing" and it's simply painting with very little paint on your brush. 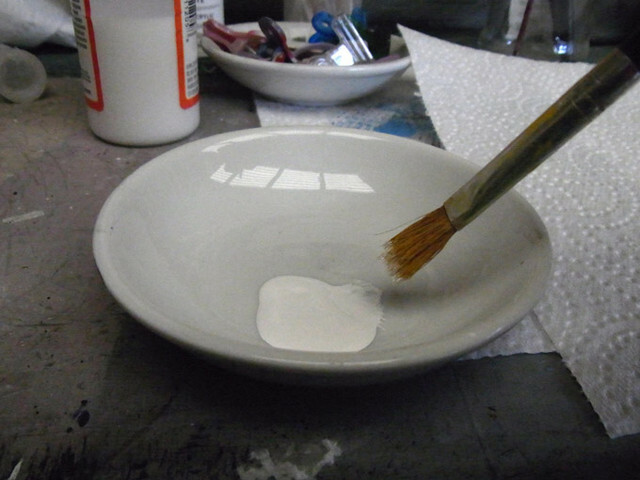 Lightly dip a stiff brush into the white paint. 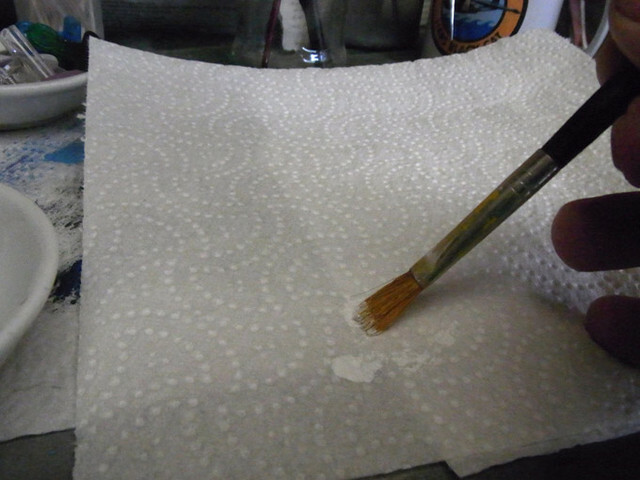 Then get rid of most of the paint by dabbing it onto a paper towel. Then streak what's left onto the silicone "wake". 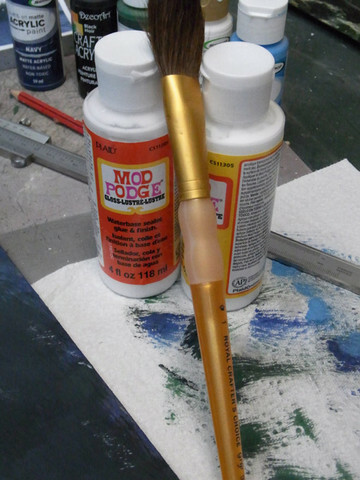 If you dab on too much paint anywhere, pick it up with the brush and spread it elsewhere. 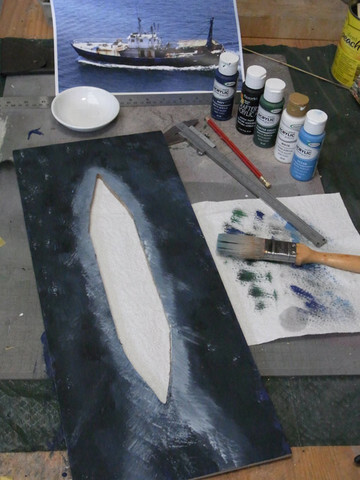 My first 'coat' of streaky dry-brushed paint was too streaky, so I did it again, concentrating more paint towards both the sides of the ship and the bow especially, and streaking it on more sparsely away from the ship hull. The final phase is a coat of clear lacquer to protect the whole thing from ageing. 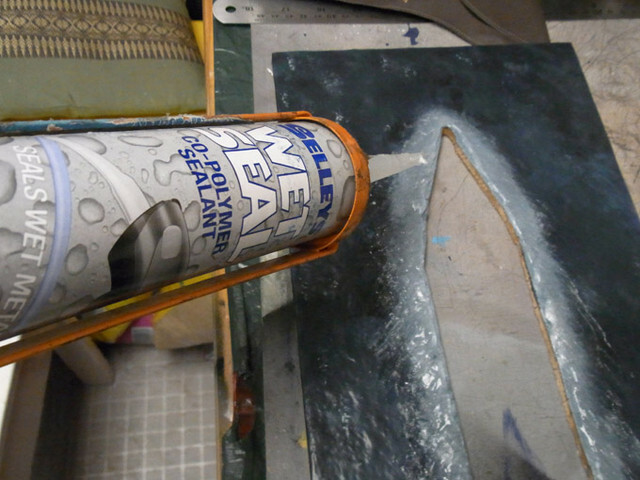 The Mod Podge 'water' is ever so slightly sticky, so the coat of lacquer helps to ease that problem. If you're wondering where I got all these techniques from, the answers are the obvious ones: Google and You Tube. Well done Jamie. It looks pretty good to me. Looks good from here as well. When someone can do something difficult and make it look simple it motivates others to think they can do t to. Exactly what this post does. Now that looks great! Impressive. I think that modeling realistic wakes takes more talent than modeling a ship, and you've got both licked. Your work reminded me of Leonardo da Vinci's efforts (really!) to understand water in its moving forms. He did sketches like these. He said: "Water is sometimes sharp and sometimes strong, .... It suffers change into as many natures as are the different places through which it passes. And as the mirror changes with the colour of its subject, so it alters with the nature of the place, becoming noisome, laxative, astringent, sulfurous, salty, incarnadined, mournful, raging, angry, red, yellow, green, black, blue, greasy, fat or slim." So, yeah, he put some thought into it, too. Thanks for taking the time to show your process. Thanks for the how-to! Excellent stuff and you're being too modest- your work turned out great! I think you should be very happy for a first effort Jamie. You've already achieved an excellent level of realism. Having the ability to see flaws in your work that others don't should only allow you to improve further. If you think you've seen this diorama setting before, you have. 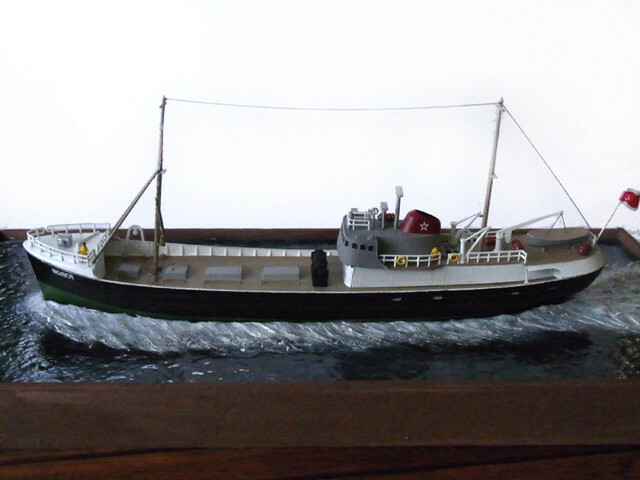 It's the one I used for my Tramp Steamer, and as this latest built plastic kit model is in the same tiny scale (1:700) I have ordered the tramps to steam out to sea while this Japanese oil tanker, the 'Shiriya' pulls in dockside at Nice, France in the pre-war years. Poor old 'Shiriya'. If there's one load you wouldn't want to be carrying when the submarine, the USS 'Trigger', fires a torpedo into your sides, it's aviation gasoline. But that's what happened, and as expected it was followed by an almighty kaboom-ball-of-fire type demise for the 'Shiriya'. That all happened in September 1943. Wow, another great build! I really love those dioramas, they add so much realism to your ships. Thanks Tom. It was "all tweezers on deck" this time round. The smallest piece was a 1mm disc (painted gold). Even though this ship is very utilitarian looking, I really like it. Working vehicles always appeal to me. And chance of doing the "after" version? This morning, I wandered back into my study to find a box, with this nice surprise in it. 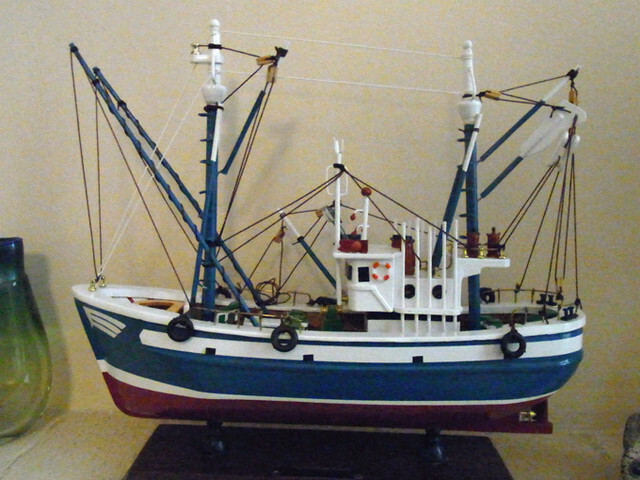 I plan to tell any strangers who visit that I am a retired fishing trawler captain, and that's a model of Flora Mae, my old boat. Pam plans to set them straight if I try that one on. It's nicely detailed. I love the tyres on the sides. It's made from wood and is a hefty lump too. Instant family heirloom. Congratulations You have a nicely detailed boat and a very thoughtful wife. I suppose you could tell the stranger that you are the owner of this fishing trawler. 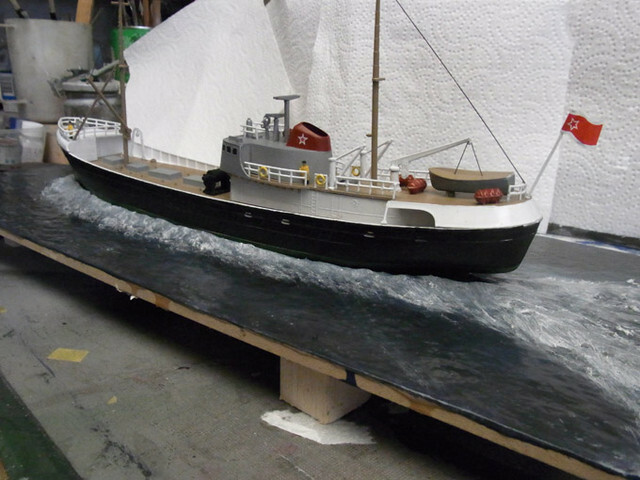 Time for a sneak preview of the next nautical diorama topic, folks. An old-style wooden speedboat from the 30s and 40s. 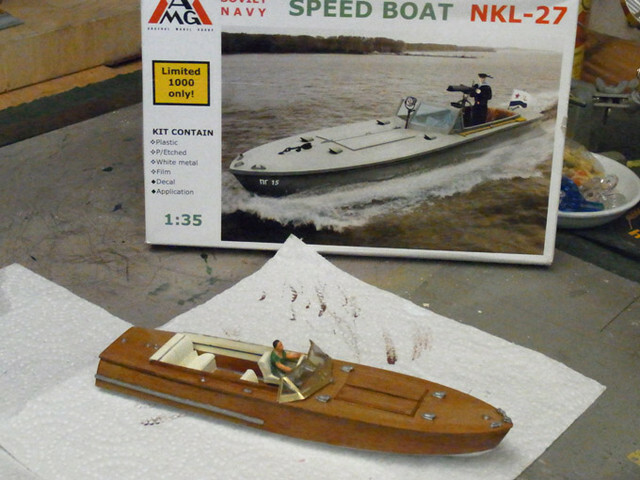 I've been searching everywhere for an old-style speedboat plastic kit to build, and came up with nothing. Then I spied this Soviet World War Two 'speed boat', which apparently did fine service on the many lakes and rivers of the Soviet Union during the war. It looked a bit like an old-style speedboat, and indeed the real thing, the NKL-27, was based on a speedboat design popular in the 1930s. The trouble was it was very basic and military, and was going to need some modifications. 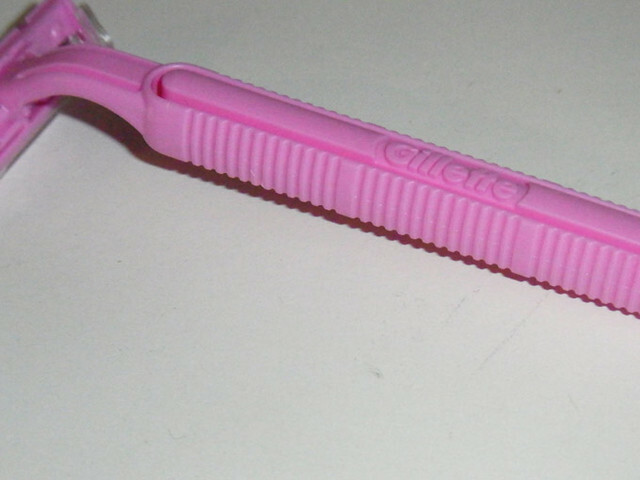 Why am I showing you a ladies' razor? Well, that's where my plush luxury seating comes from. In the kit it's plain wooden benches at the back, wooden director's chairs up front. And so I scoured our local supermarket looking for something plastic with lots of little ridges, and so it's "thank you, Gillette" for making exactly what I needed to scratch-build all the seats. 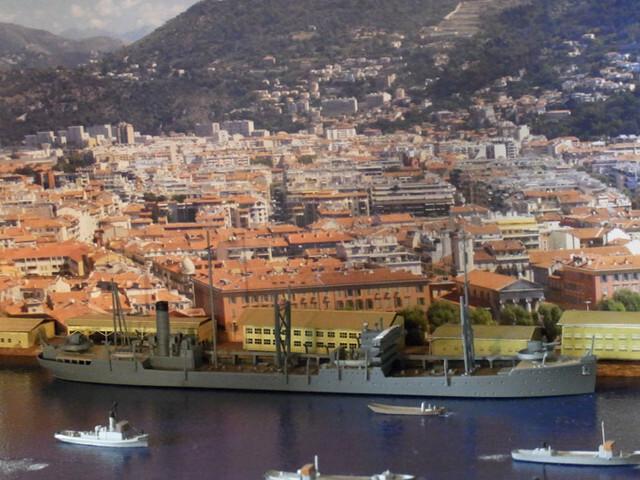 As for the diorama itself, I have Riva Aquaramas on the brain. I know they're 60s-70s era things, but I also like the Chris-Craft boats of the 30s, 40s, 50s etc. So it's a fantasy mish-mash kind of thing. It'll take at least another week to get the diorama right, so I'll do an update then. Those plush back seats need some ladies, for starters. I'm pleased with how my fake wood colouring worked out. It's a light brown underneath (called 'Wood') with a top layer of Burnt Sienna, applied very dry, lightly and streakily with a firm-bristled toothbrush. So this modded up speedboat owes a fair bit to my local supermarket's "chemist shop" aisle.